Scripps Research Institute chemists have invented a practical new method for building complex molecules that uses simple, non-toxic iron-based catalysts and can be conducted in minutes open to the air even in shot glass of alcoholic spirits. 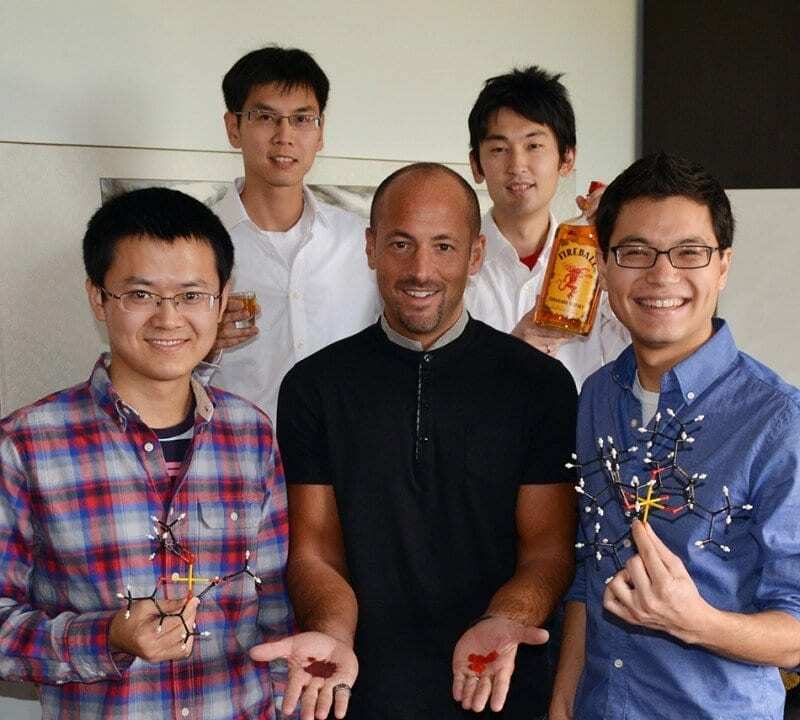 The team includes (left to right) Jinghan Gui, Chung-Mao (Eddie) Pan, Phil Baran, Yuki Yabe and Julian Lo; here, Gui and Lo are holding molecular models, and Baran holds the actual iron catalysts. “This new chemistry allows for bond constructions that have previous been simply unimaginable,” said Baran. Chemists at The Scripps Research Institute (TSRI) have invented a powerful method for joining complex organic molecules that is extraordinarily robust and can be used to make pharmaceuticals, fabrics, dyes, plastics and other materials previously inaccessible to chemists. “We are rewriting the rules for how one thinks about the reactivity of basic organic building blocks, and in doing so we’re allowing chemists to venture where none has gone before,” said Phil S. Baran, the Darlene Shiley Chair in Chemistry at TSRI, whose laboratory reports the finding on functionalized olefin cross-coupling this week in Nature. With the new technique, scientists can join two compounds known as olefins to create a new bond between their carbon-atom backbones. Carbon-to-carbon coupling methods are central to chemistry, but until now have been plagued by certain limitations: they often fail if either of the starting compounds contains small, reactive regions known as “functional groups” attached to their main structure. They also frequently don’t work well in the presence of “heteroatoms”—non-carbon atoms such as nitrogen, oxygen and iodine—despite the importance of these types of atoms in chemical synthesis. The new method is what chemists call “mild,” meaning that it doesn’t require the use of extreme temperatures or pressures, nor harsh chemicals. As a result, portions of the building blocks used that are particularly fragile remain unaltered by the reaction. “Functional groups that would be destroyed by other cross-coupling methods are totally unscathed when using our method,” said Julian C. Lo, a graduate student who was a co-lead author of the report with Research Associate Jinghan Gui. The innovation arose from a Baran laboratory project to synthesize natural compounds found in traditional Chinese medicines. April 9, 2019 - COA names new chemistry prof Mount Desert IslanderBAR HARBOR — The College of the Atlantic has appointed chemist Reuben Hudson to its faculty. Hudson is passionate about the intersection of chemistry and.